I have 1,500 rows I need to shove into a table. I don’t have access to the database, directly. But my DBA is happy to give me a HTTPS entry point to my data. 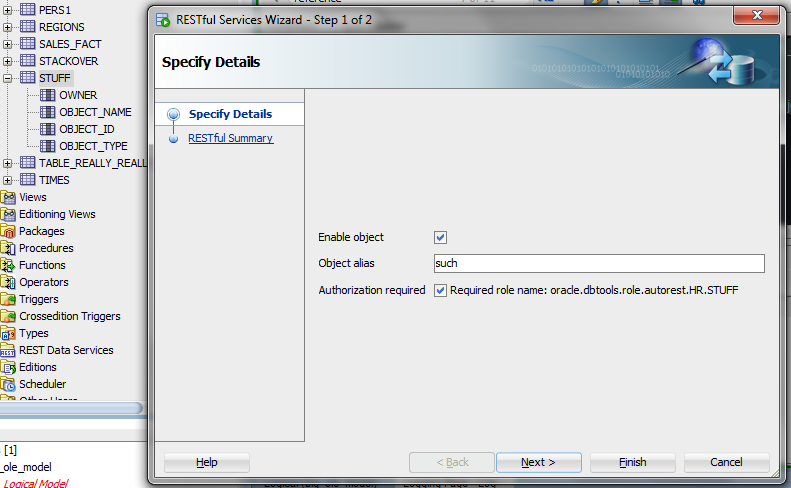 Oracle REST Data Services & Auto REST for tables. Now I’ve previously shown how to INSERT a record to a table with ORDS via POST. But that’s just one row at a time. If you want to consult the ORDS Docs, this is what we’re going to be using (DOCS). You have lots of options you can pass as parameters on the call. See the DOCS link above. I’m going to run this code in SQL Developer. You’ve already got ORDS going. You’ve already got your schema REST enabled, now you just need to do this bit to get your GET, POST, PUT, & DELETE HTTPS methods available for the Auto Table bits. Alias the table, always secure the table. Now we can make the call. The CSV will go in the POST body. And the results…about 6 seconds later. 1500 rows loaded, no errors. The first time I tried this, it was with ?batchRows=100, so 15 COMMITs for the load, and it took 12 seconds. So I cut the time in half by doing baches of 500 rows at a time. You’ll want to experiment for yourself to find an acceptable outcome. This is not the ideal way to load a LOT of data. ORDS employs INSERT statements to insert your data using the AUTO route. An external table and CTAS will always be faster. And of course you have SQL*Loader and DataPump. But those require database access. This does NOT. Or, you could always roll your own code and build your own RESTful Service. And perhaps you should. But if quick and dirty are good enough for you, we won’t tell anyone. Thank you very much for your tuto. I managed to make it work without any problems. However I am facing problem with accents. Is there a way to force charset to windows-1252? I’ve run this as mentioned in an Oracle tutorial, and it runs without problems. #ERROR Column in header row deptno421 is not defined for table. The way I figure, loader cannot see new lines. Could the actual mime-type be a problem? Hi Jeff, is this the only way to do a batch load? I’m looking for an “application/json” batch load. The only way to do batch load out of the box, yes. You could do it, but would need to write a stored proc and probably use the newer 12.2 JSON parser/packages out there to transform it to rows to be inserted into a table. If I have time/resources, I’ll look into an example of what that might look like. Tried the above and it was an easy way to import ~1500 records into a table. I have a requirement that asks to create an extract (approx 200k records) to be generated and saved to a file for processing by an external system. My question here is – Is it a good practice to use ORDS API on the procedure to generate this extract, so the external system can invoke it? Or basically when to use ORDS APIs and when not to?